Heat a medium sized frying pan to high heat cover with 1 Tbsp. of olive oil, sprinkle salt and pepper and add 1 clove of diced garlic. Cook for 1-2 minutes until garlic is slightly browned and add halved mushrooms and asparagus. Cook on medium heat until both mushrooms and asparagus are browned and slightly soft. Remove from heat and place in a medium sized mixing bowl. 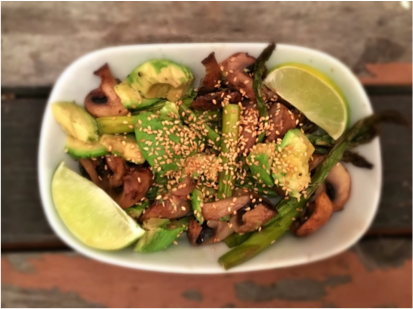 Cut avocado into small pieces and mix gently with mushrooms and avocado. Dress salad with 1 Tbsp. of olive oil and the juice from ½ of a fresh lime. Sprinkle thin slices of Parmesan cheese and sesame seeds over salad and serve. If you happen to have an office job, it can’t have escaped your notice that sitting has been shown to be associated with a variety of chronic health conditions. Office jobs are one the most common forms of employment in the developed world, so here are some tips to help you stay healthy when sitting all day. Sitting itself and the posture you find yourself in isn’t as bad as simply being still for hours on end. An expression in physiotherapy is ‘the best posture is your next posture’. This means that, above all, movement is the best thing for your body and those in office jobs can find themselves becoming very still while focused on the next deadline. Set a quiet alarm to remind you to move or change positions every 20 minutes. Getting up for phone calls and walking over to see colleagues when you have a question is a great way to break up your sitting time. While not moving is definitely the worst aspect to prolonged sitting, the postures we often adopt while sitting can also be problematic. Sitting with a flattened lower back, hunched neck and slouched shoulders is the posture that requires the least energy to maintain and is often the one we sink into in a long day. 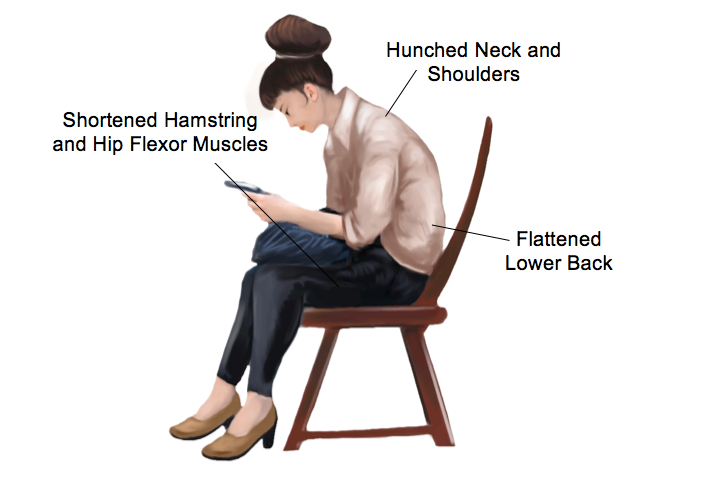 A slouched posture can lead to shortened hamstring, hip flexor and pectoral muscles. If you are spending large amounts of time sitting, it’s important to take time every day to adopt the opposite postures and keep your body flexible. This means moving into thoracic and lumbar extension, stretching your shoulders and extending your hips. Here are a few stretches you can do every day while seated that will help to reverse your posture. Try to do these stretches at your desk every few hours during a working day. Sit forward, clasp your hands behind your back and lift your arms towards the ceiling. You should feel a stretch at the front of your chest. Look up slightly to increase the stretch. You should not feel any pain or tingling in your arms. Hold for 30 seconds and repeat. Perch on the edge of your seat and straighten one leg out in front of you. Lean forwards at your hips, keeping your back straight. You should feel a gentle stretch at the back of your thigh. If you feel the stretch behind your knee or into your calf, let your ankle relax, and let your foot drop towards the floor. Hold the stretch for 20 second then swap legs, repeat this stretch with each leg twice. Sit up in your chair so your bottom is at the back of your seat and your lower back is supported. Relax your shoulders and gently tuck your chin in, imagine you are holding a soft ball under your chin and are slowly squashing it. You should feel a gentle stretch at the top of your neck. Hold for 20 seconds, release and repeat. You should not feel any pain with these stretches. Speak to your physiotherapist or visit physiodirectnz.com to find one near you. They can create a customised stretching routine that you can implement into your day at the office or for more tips on how to perform these stretches to maximum effect. None of the information in this article is a replacement for proper medical advice. Always see a medical professional for advice on your individual condition. Chop beetroot into 1cm cubes and place a large frying pan on medium heat; add olive oil, diced garlic, a pinch of salt and pepper, beetroot and cover, stirring occasionally until beetroot becomes soft and tender. 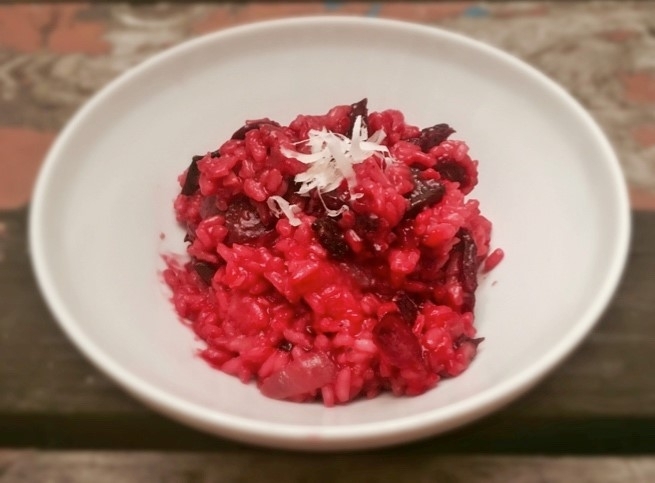 Add 2 cups of Arborio rice to the frying pan and stir through beetroot evenly. Slowly add red wine, stirring gently until the rice has absorbed all the wine. Begin to add vegetable stock, stirring through a quarter of a cup at a time. Lower heat and cover rice for 10-15 minutes, while continuing to stir risotto occasionally until rice is cooked through, add walnuts when rice is soft. Sprinkle thin slices of Parmesan cheese over risotto and serve. Osteoarthritis (OA) is a degenerative disease that affects the cartilage of joints. Cartilage is a firm, flexible connective tissue that lines the surface of many joints. It provides shock absorption and cushioning for the bony surfaces of those joints as they move. During the process of OA, cartilage gradually begins to break down and is worn away. This means that the bony surfaces below the cartilage start to rub together, creating increased stress and friction. The body reacts to this increased stress by creating small bony deposits around the joint. As more of these are created the joint becomes increasingly painful and difficult to move. 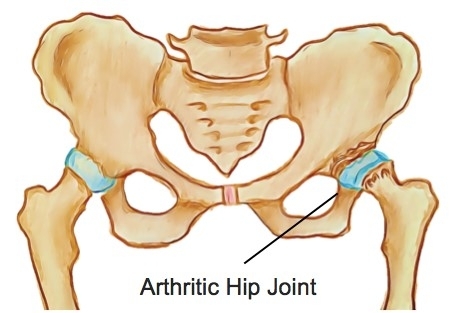 The most common symptoms of hip OA are pain and stiffness with reduced movement of the hip, particularly in the direction of internal rotation. These symptoms in a person over the age of 50, in the absence of a trauma that may have caused a fracture, indicate possible OA. Pain originating from the hip joint can be felt as a deep ache that can be noticed in the groin, buttocks, thigh or even knee. It is also typical for sufferers of OA to experience stiffness in the morning upon waking that lasts less than 30-60 minutes. Grating or cracking sensations with hip movements are also common complaints, along with mild to moderate joint swelling. In the early stages, mild pain may be felt with activities such as walking or running. As the disease progresses these activities will become more painful with the muscles that provide additional support to the joint becoming weaker, exacerbating the disease process. For many people, a total hip replacement may be necessary to reduce pain and restore function. Treatment will also include stretching, trigger point therapy, joint mobilization to increase the joint’s mobility, and a personalised exercise program, including hydrotherapy and isometric exercises that work to increase muscle strength while putting less pressure on the joint. For those whose best course of treatment is surgical joint replacement, physiotherapy can help to achieve great outcomes by helping with effective preparation and rehabilitation, getting you on your way to recovery as quickly as possible. None of the information in this article is a replacement for proper medical advice. Always see a medical professional for advice on your individual condition. Ideally, your body should be held in a position of minimal stress while sleeping. This means that all your joints and muscles are resting in a neutral position. Over time, joints that are held in more extreme positions may put pressure on the surrounding structures. This may lead to a feeling of stiffness in the morning. Here are a few of our top tips for comfortable sleeping. Sleeping on your stomach with your head turned to the side can be the cause of many issues. If this is your preferred sleeping position, it could be worth chatting to your physiotherapist about strategies improve your sleeping posture. Side sleepers often spend their nights with one leg crossed over their body. This can place extra pressure on the structures on the side of the hip, such as tendons and bursa. This can also impact the health of these tissues as compression can reduce the blood flow to the area. If the mattress is too firm then the hip on the underside of the body may also be compressed under your bodyweight. Speak to your physiotherapist for more advice on how to improve your sleeping posture and find out if your sleeping setup is right for you. Preheat your oven to 180 degrees Celsius or 350 degrees Fahrenheit. Chop brussel sprouts in half and place on a baking tray lined with baking paper. Sprinkle sprouts with olive oil, salt and pepper, add garlic and cover with almonds. Roast brussel sprouts in the oven for 20-30 minutes until slightly brown. Prepare kale by chopping into small pieces and placing in a medium sized salad bowl. Prepare salad dressing by whisking together olive oil, red wine vinegar, salt and pepper. 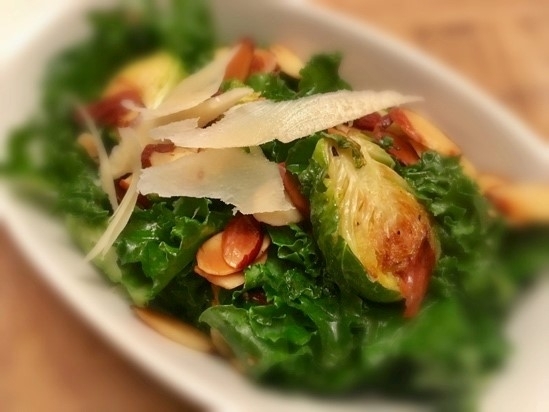 Mix brussel sprouts, almonds, kale and dressing together gently in the salad bowl. Sprinkle thin slices of Parmesan cheese over salad and serve. Medically known as Medial Tibial Stress Syndrome, shin splints is a term used to refer to pain along the inside of the tibia or shin bone. The exact pathology that causes the pain of shin splints is unclear and imaging such as ultrasound produces similar results when compared to persons who don’t have shin splints. 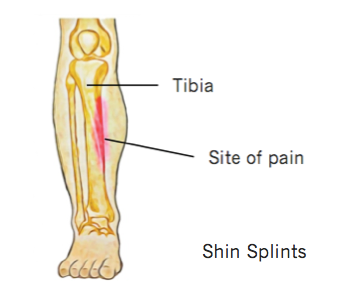 The pain of shin splints is usually felt over the area where two particular muscles insert into the tibia. These are Tibialis Posterior and Flexor Digitorum Longus, these muscles act to extend the foot and toes respectively. Despite having an unclear pathology, this can be a debilitating condition that can impact activity levels significantly. The pain can be quite limiting and may even be an early warning sign of a stress fracture and this will need to be ruled out by a medical professional. Shin splints are typified by persistent leg pain, usually the inside of the shin, halfway down the lower leg. The pain might be felt during exercise or directly after. Some people experience a dull ache over their shin that lasts for quite a while after exercise stops, while for others the pain may be sharp and fades quickly. The pain is often progressive, becoming worse with shorter distances. Eventually shin splints can severely impact activity levels as the pain becomes too severe to continue exercise. Females are more likely to develop shin splints than males. help to adapt your training program to a level that is optimum for you. A period of relative rest may be recommended along with a targeted strengthening and stretching program for any tight or weak muscles. Switching to low-impact activities such as swimming, cycling and yoga may also help to maintain fitness during recovery. Your running technique will be analyzed and any training errors may be corrected. When getting back into your training routine, it is usually recommended that distances are not increased by more than 10% per week as this allows the tissues of the body to react to the increased demands and adapt accordingly. 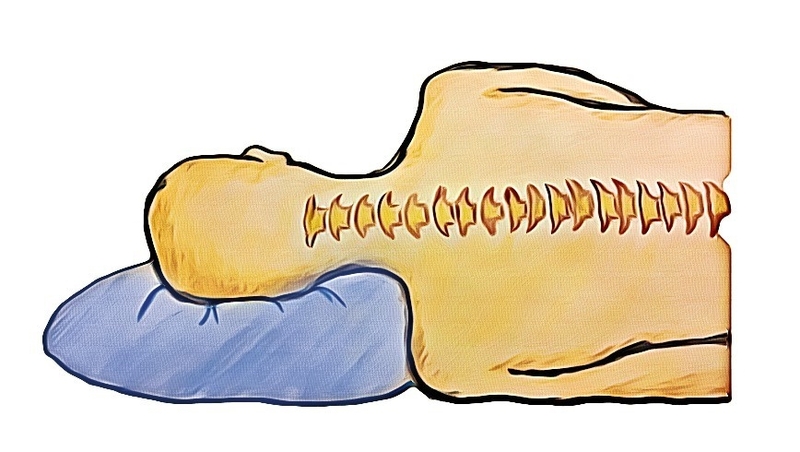 One of the primary roles of the spine is to protect the spinal cord. This means that the spine needs to be strong while maintaining the flexibility required for a movable trunk. While the spine is very sturdy, spinal injuries do occur. Health professionals often use terms to describe and classify injuries of the body, two of these terms that you may have heard are Spondylolysis and Spondylolisthesis. 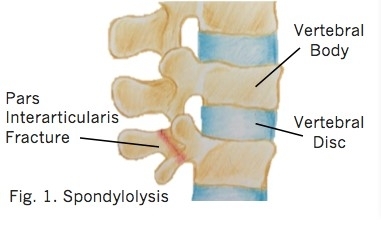 Spondylolysis refers to a stress fracture of the pars interarticularis of the vertebra. This is the part of the vertebra that connects the body of the vertebra with the rest of the vertebra that surrounds the spinal cord. A separation of this fracture where the body of the vertebra is displaced forwards or backwards is called a spondylolisthesis. Spondylolisthesis is a progression of spondylolysis and is given grades to classify its severity. Both spondylolysis and spondylolisthesis commonly affect the fourth and fifth lumbar vertebrae, found at the base of the lower back. Spondylolysis and spondylolisthesis can be a result of trauma with the spine being moved forcefully into extension, particularly in younger people. Certain sports such as gymnastics, football and weightlifting require repetitive backward movements of the spine. 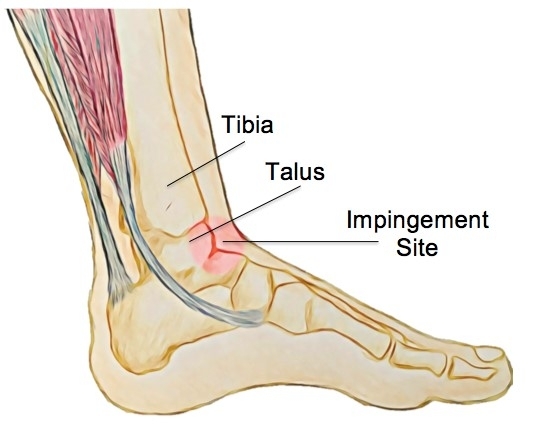 This can eventually lead to a stress fracture of the pars interarticularis. Growth spurts in teens have also been known to be responsible for the development of these conditions. In older adults, common causes of spondylolysis or spondylolisthesis are degenerative changes in the spine due to aging, osteoporosis, infection or even a tumour. Some people have a genetic vulnerability in this area of their spine. This makes them more susceptible to developing spondylolysis and then spondylolisthesis. Many people with spondylolysis and spondylolisthesis may be asymptomatic, which means they perform their normal activities without experiencing any symptoms. However, when symptoms do occur, common complaints are pain and tightness, much like a muscle strain, spreading across the lower back. This pain may be eased by bending forwards and aggravated by walking, running or leaning backwards. In more progressive cases of spondylolisthesis, the shift of the vertebral body can cause narrowing of the spinal canal that can lead to nerve compression. This may cause hamstring tightness and even numbness and weakness of the lower limbs, affecting gait and daily activities. Your physiotherapist will work closely with you and any relevant medical professionals to determine exactly what is needed for your particular condition. Severe instability in the spine may require stabilization surgery. However, this is rare and in most cases symptoms of spondylolisthesis can be improved with regular physiotherapy management. Physiotherapy that focuses on strengthening and improving the flexibility of both the lower back and the abdominal muscles has been shown to have positive effects on both pain and function for those with symptomatic spondylolysis and spondylolisthesis. Speak to your physiotherapists for more information regarding your individual condition. None of the information in this newsletter is a replacement for proper medical advice. Always see a medical professional for advice on your individual injury. When injury strikes, the first thing that most of us want to know is ‘when will my injury heal?’. Unfortunately, the answer to this can be complicated. It requires at least a little understanding of how the different tissues of the body heal. Each of the tissues of the body, including muscles, tendons, ligaments and bone, heal at different speeds. Also, each individual will have some variation on those times as a result of their individual health history and circumstances. Understanding the type of tissue injured and their different healing times is an important part of how your physiotherapist approaches treatment and setting goals for rehabilitation. On an individual level, a patient’s age, the location and severity of the injury and the way the injury was managed in the first 48 hours all affect the healing times of an injury. Unfortunately, as we age, injuries do tend to heal more slowly than when we are young. Any medical condition that reduces blood flow to an area, such as peripheral vascular disease, can also reduce the body’s ability to heal at its usual rate. There are some guidelines that can be followed when predicting how long an injury will take to heal based on the tissue type affected. Muscles are full of small capillaries, giving them a rich blood supply. As such, they have a comparatively fast healing time with 2-4 weeks for minor tears. This time will be extended for larger tears and more complicated presentations. Ligaments and tendons have less access to blood supply and tears to these tissues generally take longer to heal. Larger or complete tears of all soft tissues may not be able to heal themselves. In rare cases, surgery may be required for complete healing to occur. Similarly, cartilage, the flexible connective tissue that lines the surface of joints is avascular, which means it has little or no blood supply. To heal, nutrients are supplied to the cartilage from the joint fluid that surrounds and lubricates the joint. While the different tissues of the body all have different healing times, they do follow a similar process of healing with three main stages, the acute inflammatory phase, the proliferative stage and finally the remodeling stage. The inflammatory stage occurs immediately after an injury and is the body’s primary defense against injury. This stage is identifiable by heat, redness, swelling and pain around the injured area. During this phase the body sends white blood cells to remove damaged tissue and reduce any further damage. This stage usually lasts for 3-5 days. The proliferation stage is the phase where the body starts to produce new cells. Swelling and pain subsides and scar tissue is formed that eventually becomes new tissue. This stage usually occurs around days 7-14 following an injury. The final stage, known as the remodeling stage is when the body completes healing with the reorganization of scar tissue and the laying down of mature tissue. This stage usually occurs roughly two weeks after the initial injury is sustained. At each stage of the healing process a different treatment approach is required and your physiotherapist can help to guide you through your recovery. Ask your physiotherapist to explain how your injury can be managed best and what to expect in your recovery process. Rotator cuff tears are common injuries and can occur in any of the four muscles. 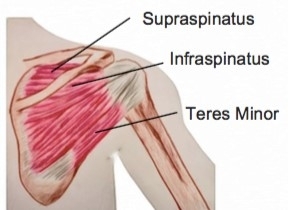 This usually occurs at their weakest point, the junction between the muscle and tendinous tissue. These tears are common in racket and throwing sports and are one of the leading causes of shoulder pain. The prevalence of rotator cuff tears increases as we age due to age related degenerative changes in the tissues. It is interesting to note that the size of a tear is not necessarily related to the amount of pain and dysfunction experienced. Small tears sometimes create large problems and large tears can even go unnoticed. Preheat your oven to 180 degrees Celsius or 350 degrees Fahrenheit. In the meantime, heat a medium sized frying pan to medium heat and add crushed almonds. Stir almonds frequently, until warm and toasted, removing them from heat as they begin to brown. In a small bowl, mix the ricotta cheese and half of the toasted almonds. Stir gently until they are thoroughly combined. Use a small knife to carefully remove the seed from the dates (if using seeded dates), making space for the ricotta mixture. 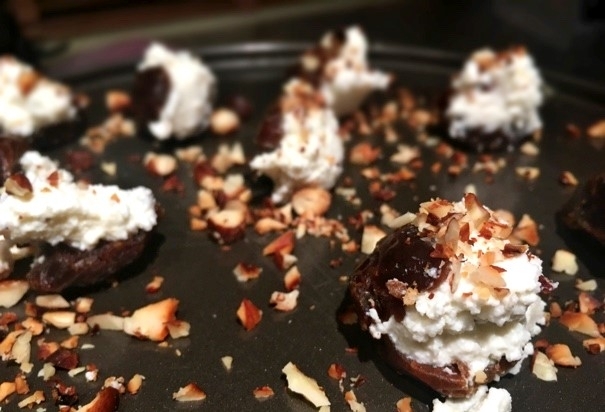 Spoon ¼ teaspoon of the ricotta mixture into each date and place on a foil-lined baking sheet. Place dates on the sheet, ensuring they are not touching each other and drizzle with olive oil. Sprinkle the remaining almonds on top along with a small amount of sea salt. Roast dates for 15-20 minutes until ricotta is melted. Remove from oven and immediately drizzle balsamic glaze. Heat a medium sized frying pan and add oil, diced onion, salt and pepper. Cook on medium heat for 3 minutes or until onion becomes soft and clear. Add kidney beans, tomatoes, cumin and chili powder and cook for a further 10 minutes. Cover and continue to simmer on low heat. Heat a separate medium sized frying pan to medium and add a splash of oil. Place one tortilla on the pan and cover with ½ cup of cheese and ½ cup of tomato bean mixture. Place another flour tortilla on top (or fold your tortilla in half, depending on the size). Cook for 2-3 minutes and flip tortillas over and cook the other side. Once the cheese has melted, remove tortilla from heat and repeat with process. 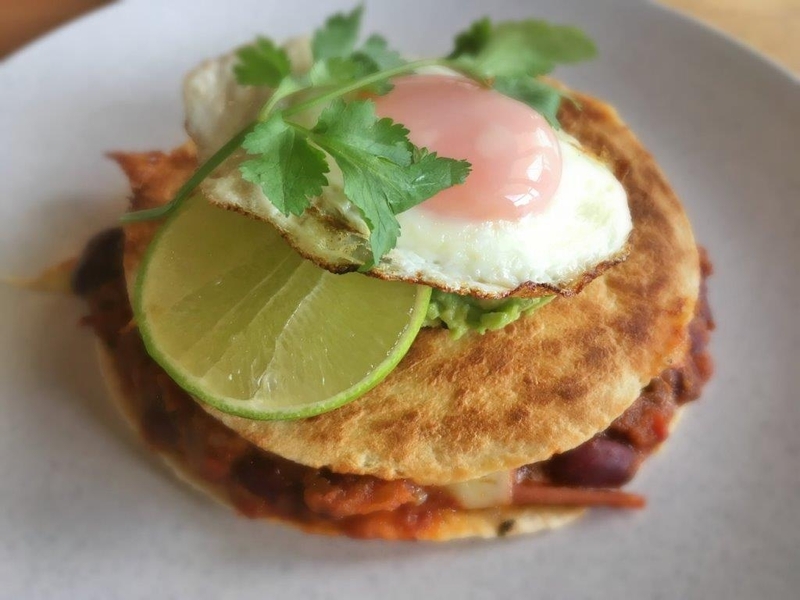 Fry two eggs and place on top of tortillas. Garnish with lime and coriander. Research shows that many children today are struggling to meet their daily-recommended targets for physical activity. We know that inactivity is a risk factor for a multitude of chronic diseases. Many of the habits that shape our adult lives are also set in childhood. Physical activity is important for a growing body as movement and weight bearing have a large impact on bone strength, muscle and tendon health. Here are some tips to make sure your children stay active. Find an activity that suits your child’s personality and abilities. Children who are very coordinated and excel in competition may find team sports both increase their self-esteem as well as keep them fit. For other children, being a part of a team can cause embarrassment. They may say they dislike exercise, while they actually dislike feeling like a failure and letting down the team. These children may prefer a sport where success measured by improving on their own performance, rather than being compared to other children. Surfing, yoga, martial arts, dancing or gymnastics may be activities that suit your child if competitive and team sports cause them to be discouraged. Do get injuries checked out by a professional and invest in proper rehabilitation. 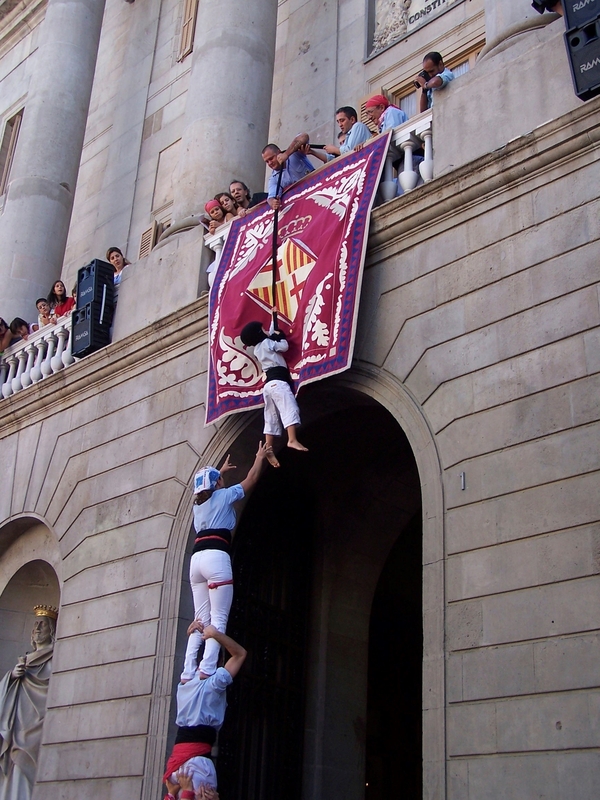 Some children may retain worries that they will hurt themselves again because of a previous injury. This can cause them to avoid exercise because they don’t feel completely confident. Your physiotherapist can help to identify any issues that your child is having and help to resolve them. Set fun and challenging goals for them to complete during their daily routine. As less children are walking and riding to school, try to find ways to fit extra activities into the day. Have a daily long jump competition in the back yard at the same time each day or have bed making time trials. Have a routine before bed of age appropriate exercises, such as star jumps, hopping, balancing and running on the spot. You can make this part of the night or morning ritual, just like brushing your teeth. Talk to your physiotherapist for more tips on how to increase your child’s activity levels. Finding an activity that matches your child’s age level is key to keeping them engaged and active. None of the information in this article is a replacement for proper medical advice. Always see a medical professional for advice on your individual injury. What is Lumbar Disc Degeneration? 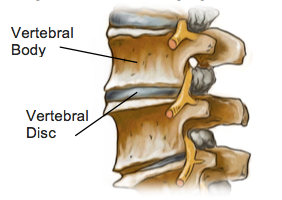 The discs of the spine sit between the vertebral bodies and act as shock absorbers for the spine. In the lumbar spine the outer part of the disc is made up of thick fibrous rings called the annulus fibrosus. The inner part is a soft jelly like substance called the nucleus pulposus. The discs in the spine also move to allow flexibility and movement of the spine, particularly in the lumbar spine where they are the largest. As we age, our discs begin to dehydrate, losing height, elasticity, and flexibility. The result is a spine that can feel stiffer, less flexible and a bit sore with certain movements. While almost everyone will have some degree of degeneration into their later years, not everyone will experience symptoms. The most commonly felt symptoms of disc degeneration are stiffness and pain in the lower back. The pain is usually felt over the spine where the disc degeneration has occurred, but also often radiates into the buttock region. In severe cases of disc degeneration, increased wear and tear can cause bony spurs to develop on the vertebral body. These spurs can cause muscle weakness, numbness and tingling sensations in the leg and foot if they place pressure on the nerves around the spine. Disc degeneration usually affects people over the age of 50, however symptoms can begin in your 30s. As we age, all of our tissues gradually lose collagen and elastin in the spinal discs. This process results in smaller, less flexible discs. Repetitive activities like bending on the waist to lift heavy objects and prolonged sitting also cause additional wear and tear of the discs. This amplifies the degenerative process. Imaging such as MRI and XRAY can help determine the level of degeneration that has occurred with increasing accuracy. However, in recent years research has shown that the level of degeneration that can be seen in imaging cannot reliably predict the amount of pain a person will experience. This can be confusing for patients and having scans that show large amounts of degeneration can be a distressing experience, regardless of symptoms, making patients feel helpless. Physiotherapy can help patients return to their normal activities as soon as possible and regain optimal function for their individual presentation. In addition, physiotherapy helps patients to manage their pain by helping them understand their pathology and, strengthen trunk stabilizers to prevent recurrence of any injury.